1958 JAGUAR XK150 FIXED HEAD COUPE – Daniel Schmitt & Co. This XK150 is finished in gorgeous Cotswold Blue with a deep red leather interior. 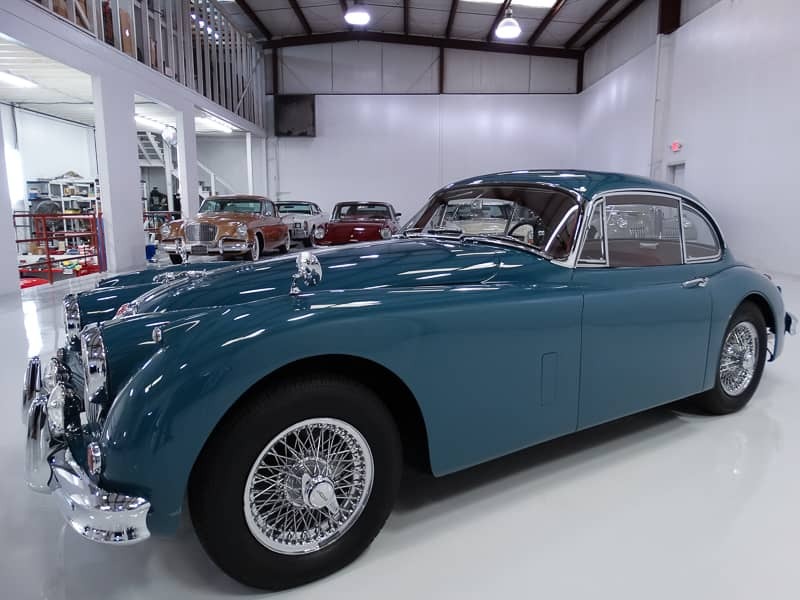 It is one of the most sought-after color combinations in the collector market today and the original color combination per the Jaguar Heritage Certificate. Accompanying this investment-grade Jaguar is its operating/maintenance/service handbook, maintenance chart, tools, jack, and Jaguar Heritage Certificate. We are pleased to offer what we believe to be one of the best examples of this iconic model to be found on the market today. Ready to make an investment that you can actually enjoy? According to Motortrend, the classic car market has recently shown more growth than hedge funds, with projected returns of 161% after five years and a whopping 467% after a decade. Please contact one of our expert sales consultants for more information. They will be happy to give you a complete walk-around, supply you with a more detailed description, and answer any questions that you may have. Bid with confidence; you will not be disappointed in this incredible motorcar.